I returned from the cold north land hungry for a warm bowl of chili con carne. It’s not Mexican cuisine, but sometimes we expats need familiar comfort food from home. Chile, the picante vegetable that has its origins in the Americas, only has one correct spelling in Mexico. Aberrations like chilli and chilie occur north of the border, causing confusion to many and consternation to those like me who are sticklers for correct spelling. Chili con carne, the pot of well-seasoned beans and meat spelled with an “i”, further adds to the confusion. If we go back to the source of the word for the vegetable, to Nahuatl, the language spoken by the people of the Mexican Highlands when the Spanish arrived, we find chili. Confused? Don’t be. Just stick to the contemporary Spanish spelling for the vegetable: chile. And if it’s a pot of beans and meat: chili. Now that the issue of spelling is out of the way, there are two more matters to discuss: whether to soak beans or not, and how to cook them. Mexican cooks don’t pre-soak beans. They just add beans to water and get on with the cooking. No soaking or draining for them. I pre-soak beans, but I’m not always organized enough to think of doing this the day before, so I use the quick-soak method, which means to bring beans and plenty of water to a boil, turn off the heat, cover the pot and leave the beans to soak for one hour. Then drain and cook with fresh water. Pre-soaked beans are thought to be less musical and more digestible. And take less time to cook. I’m all for anything that takes less time and fuel. North of the border, kidney beans are preferred for chili con carne, but any bean will make a tasty chili. Today, I’m using a combination of organic black and flor de mayo beans. Mexican cocineras use their trusty aluminum pots or clay pots for cooking beans. Earthenware clay pots absorb the odors of the foods for which they are used, so savvy mexicanas dedicate one clay pot to beans, another for chicken, one pot just for chocolate, and so on. Lately, my love affair with the clay pot has waned, and I’ve been using the pressure cooker to make tender beans in thirty minutes. The beans are pre-soaked in a small pot that is then placed on a metal trivet or rack in the larger pressure cooker. Beans can also be cooked directly in the pressure cooker, but care must be taken that the pot does not cook dry and that the beans do not burn, as some pressure cookers have thin bottoms. My pot of chili con carne contains chiles poblanos, one of my favorite chile peppers found throughout Mexico. Thick-walled, rich green in color, and not too hot, they are often used for making chiles rellenos, but can be a stand-in for bell peppers when making chili con carne. This is one of the few times they are not blistered and peeled. Thanks to a recipe I came across in an issue of Consumer Reports years ago, I learned to add vinegar to a pot of chili con carne. This one addition makes all the difference. Maybe it does nothing more than provide a balance to the sweetness of the tomatoes, but it is an essential taste adjustment. Heat oil in a large skillet or pot over medium heat. Cook meat, onion, garlic and poblano until tender and meat is no longer pink. Add all remaining ingredients, except vinegar and salt. Simmer 30 minutes. Add vinegar and simmer 15 minutes. Serve garnished with crushed tortilla chips and cilantro. Vegetarian version: omit meat and add two more cups of cooked beans. This beany chili con frijoles was a favorite during my vegetarian years. Large Mexican grocery stores are stocking more and more organic foods. A common organic label in our part of Mexico is Aires de Campo. They are certified by BioAgriCert America, an organization based in Bologna, Italy, which controls and monitors organic foods in the Americas, Japan and Europe. Aires de Campo sells organic beans and brown rice, as well as other foodstuffs like preserves, agave syrup and honey. My packages of black beans and flor de mayo beans (a pink bean also known as mayflower bean and nightfall bean) include the information that they are from the state of Zacatecas and certified free of pesticides, synthetic fertilizers and toxic residues. It is so great to have organic beans and rice available, that even if they cost a little more, I’m more than happy to support this market. Flor de mayo is a tender bean with a delicate flavor that is not well known north of the border. South of the border, it is a common bean that is greatly preferred in the central areas of Mexico. It can be purchased on the internet from native seed companies. It is so easy to reach for the can opener and have beans or refritos on the table in minutes, but like so many other familiar foods, canned does not compare to freshly cooked. Yes, it takes more time, but once you make a few pots, you will see how easy it is and how much better they taste. In forty-eight hours I will be serving a Christmas dinner to long-time friends, and I feel like I’m in the final count down with all the necessary preparations. As I go through my favorite cookbooks, with an eye to showcasing Mexican specialties, I am thinking what a wonderful year this has been for Cooking in Mexico. Each one of you who has visited, each comment left, each question asked, is greatly appreciated and adds to the value of the shared recipes and food experiences. I love being a food blogger. The cooking, the photography and the writing — it is all so much fun and satisfying. But it wouldn’t mean as much if you, the readers, weren’t here, also. Thank you so much for your visits, comments and new friendships. You have helped make 2010 a wonderful year for me. Here are some of my favorite recipes from the past that may serve as inspiration as you prepare your holiday dishes. Holiday Eggnog Cream Cake A wonderfully delicate cake with all the flavors of eggnog. Christmas 2009 Cooking and Baking Revisited with links to recipes for lemon curd, beet-pickled deviled eggs, golden onion pie, chocolate biscotti and whole wheat bread. Jocoque Cheesecake with Lemon-Orange Curd and Candied Orange Zest, the smoothest cheesecake you will ever make. Grilled Tenderloin of Beef with Grilled Vegetables, for those who want something besides roast turkey, and what we are having for our Christmas dinner this year. 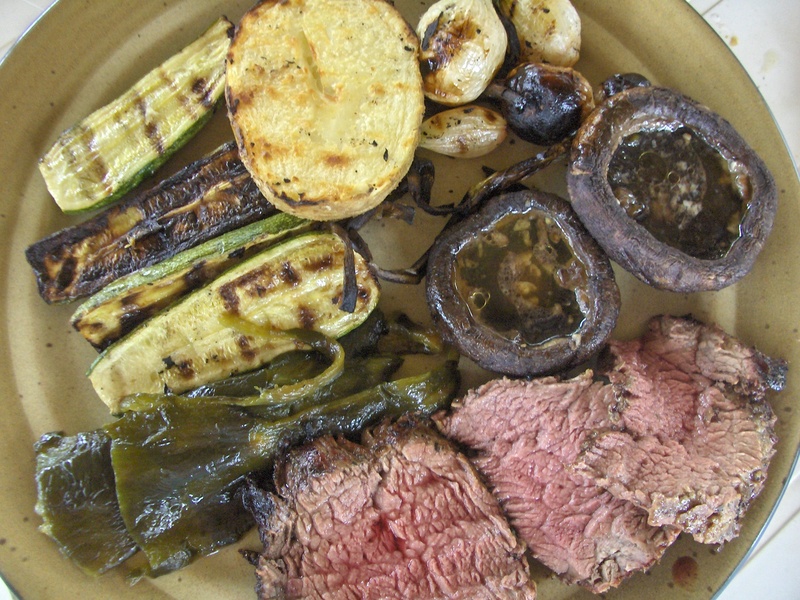 Salsa de Chile Pequin (or serrano chile) to add zip to your left-over grilled tenderloin. 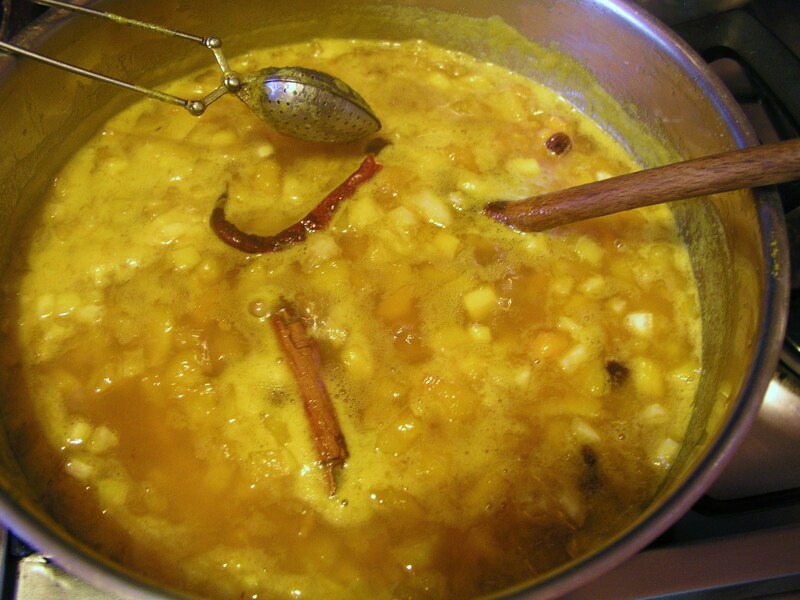 Chutney and mangoes both originated in India, the birthplace of my mother. As a child, my mother’s second language was Urdu. She probably knew the word for chutney, چٹنی, spelled phonetically as catni. 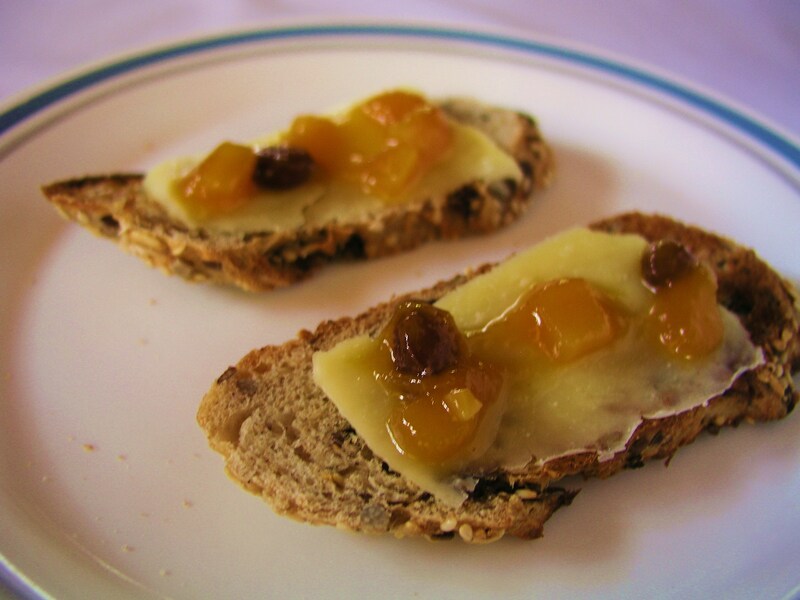 Making mango chutney connected me to that far-away country, when that part of the world was still part of the British Raj. Chutneys in India are described by Wikipedia as “pasty sauce” made with a mortar and pestle. They can be sweet or hot, both forms containing spices. 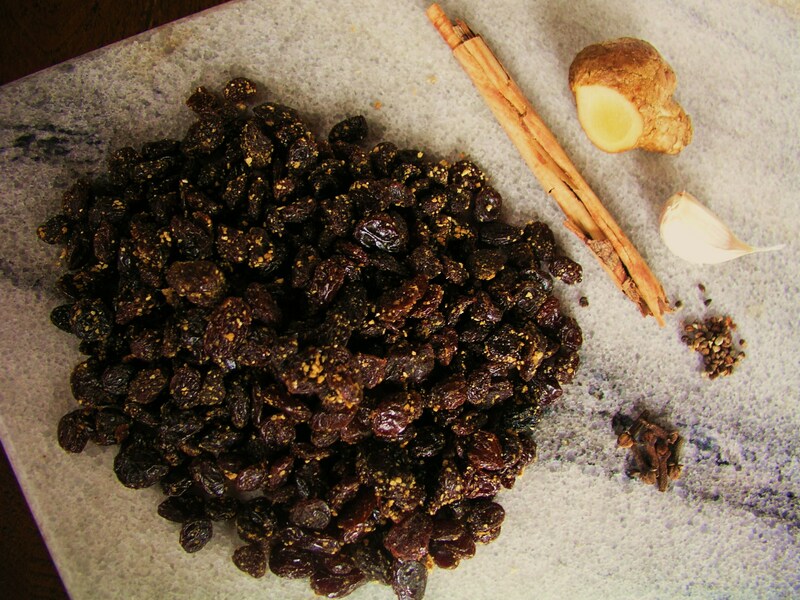 The western palate has adapted chutney to the familiar tastes of fruit, sugar and vinegar, reduced with many of the same spices found in curry. Joy of Cooking, the first cookbook I owned, inspired this recipe. Mango Chutney can be blended with mayonnaise to dress a chicken salad, served with crackers and queso fresco (or cream cheese), and enjoyed as a condiment with curries and stir-fried dishes. Combine all ingredients in a large, heavy-bottomed pot. Cook over medium-low heat, stirring occasionally, until thick, about one hour. Remove chile pepper, cinnamon stick and cardamom and cloves. 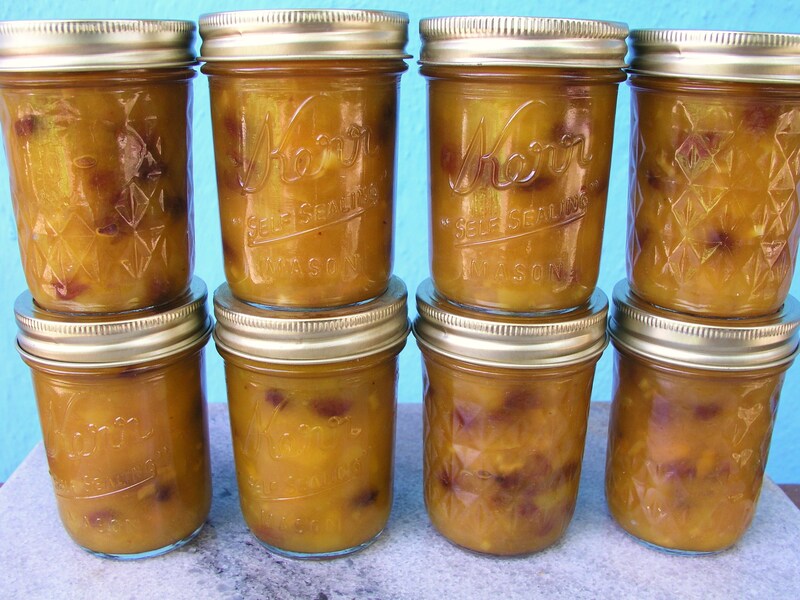 Spoon into sterilized half pint canning jars, cap and seal tightly. Process for 15 minutes in a boiling water bath. Makes 9 cups (about 2 liters). In case you are wondering why the raisins in the above photo look a little crumby, there is a perfectly good explanation. 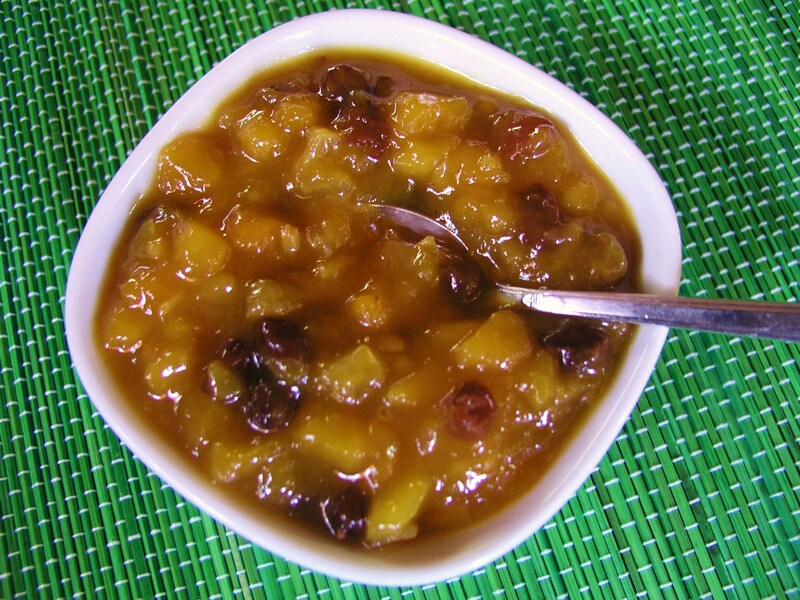 When I started to make Mango Chutney, I discovered I was out of raisins. The solution was to sort through the box of All Bran cereal, picking out every raisin I could find. Desperate times call for desperate measures. “Process in a boiling water bath” means to submerge the canning jars, tightly sealed, in a pot of water and bring to a boil for 15 minutes. Carefully remove the jars with tongs and cool. Store in a cool place. These instructions are for sea level. If you live at a high elevation, consult high altitude cooking directions for proper time. So that the small cloves and smaller cardamom seeds are not lost in the chutney, tie them up in a piece of cheesecloth, or put them in a tea infuser. Whichever you use, the spices are easily removed from the chutney to be discarded after cooking. Russ’s birthday menu yesterday featured grilled tenderloin of beef with a selection of beautiful vegetables, plus pineapple slices. 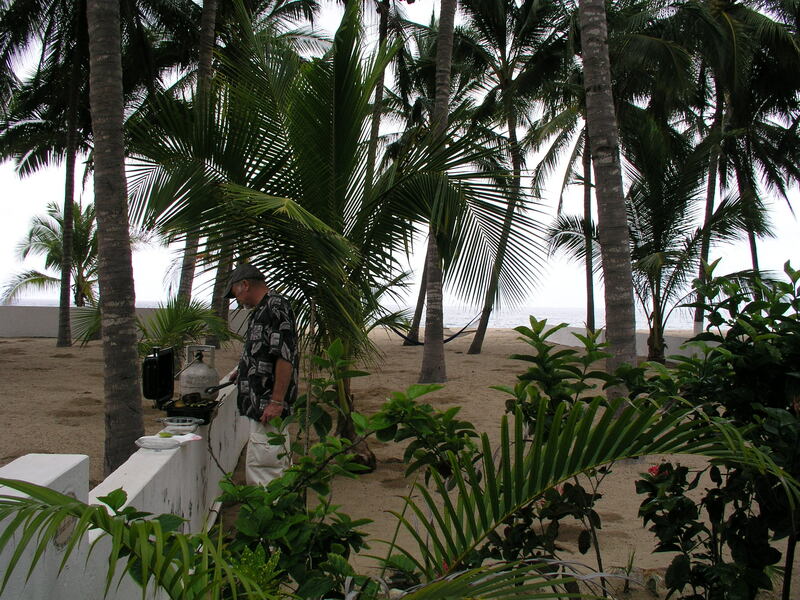 We spent the afternoon at our friends’ beach house in San Pancho, and the setting could not have been any better. There was no blue sky to highlight the blue of the ocean, which you can barely make out at the end of the sand. It is hard to believe that Hurricane Alex, so far on the other side of Mexico, sent its cloudy arms over the western coast, hundreds of miles away. The birthday boy is also the grill master, and he likes his grilled meat fairly simple, without distracting bar-b-que sauces and seasonings. A simple marinade of olive oil and minced garlic bathed the tenderloin in a zip lock bag until it was grill time. 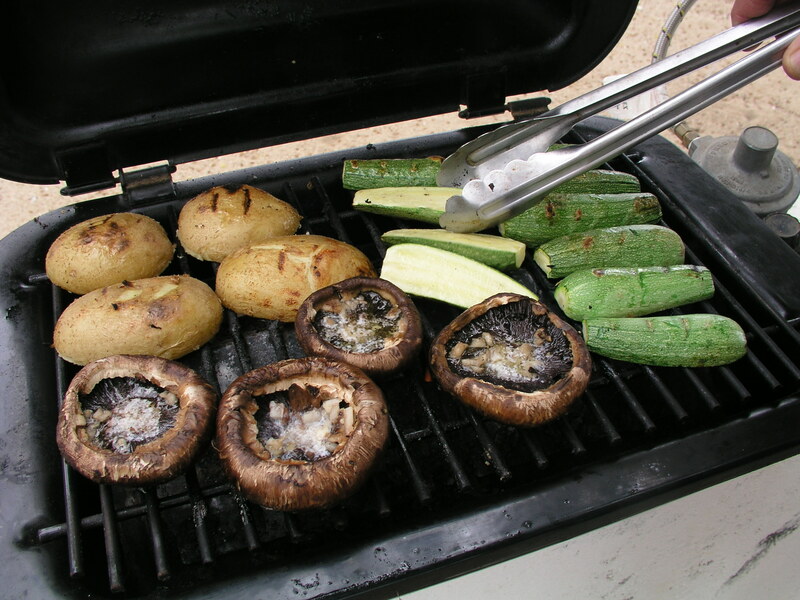 The remaining oil in the bag was then brushed on Mexican squash halves, pre-cooked, halved potatoes, and portobello mushrooms, which also got generous pats of organic butter. 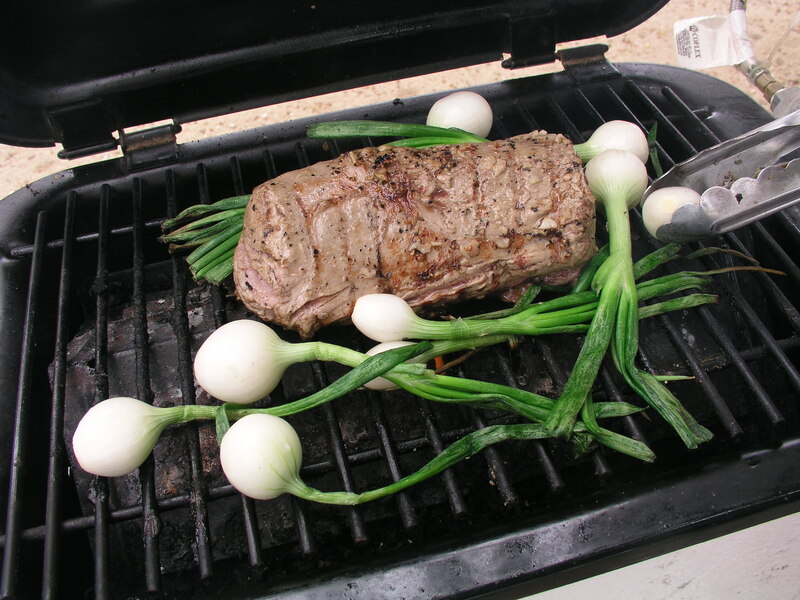 The over-sized green onions (known as chambrays in this part of Mexico) went on the grill as is. There’s not much you can do to improve carmelized onions right off the grill. Same for the whole poblano chiles (how to roast and peel chiles) and the sliced pineapple, which added a sweet taste at the end of the meal. For us, less is more when grilling. KISS is our grill motto. Do I have to spell that out for you? Grill the tenderloin as one piece, rather than cut into individual steaks, to retain maximum moisture. After it is removed from the grill, cover with foil and allow it to rest for 15-20 minutes to allow the juices to redistribute. 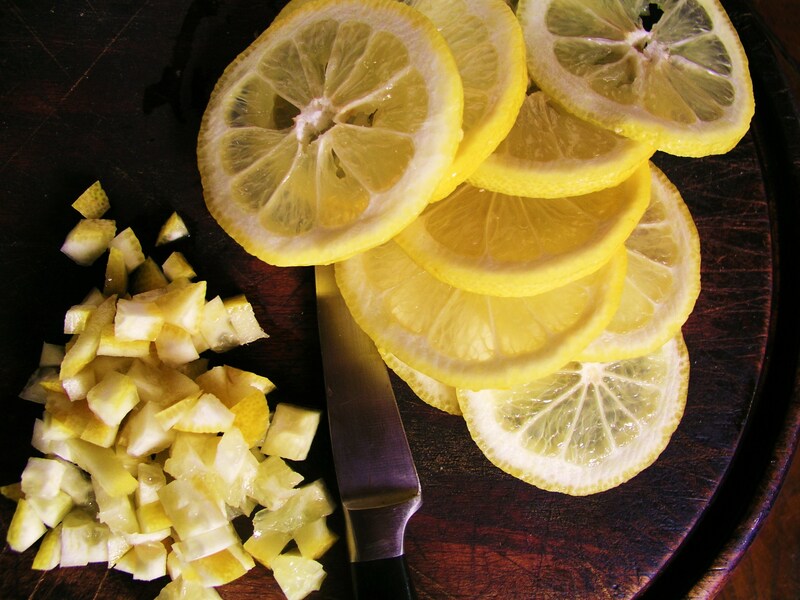 If it is sliced immediately upon coming off the grill, without a rest time, too much juice will drain out of the slices, resulting in drier meat. A tenderloin is too special to be treated this way. Use an instant-read thermometer for the best indicator of doneness. you are over-cooking one of the best cuts of beef. The tenderloin was from Kenny’s Meat Market in La Cruz, where the beef is from range-fed cattle. At 120 pesos a kilo, that works out to just under $5 a pound. If you are shopping for tenderloin in a carnicería in Mexico, ask for “filete”. OK, since you asked, I’ll spell KISS for you. Keep It Simple, Sweetie. 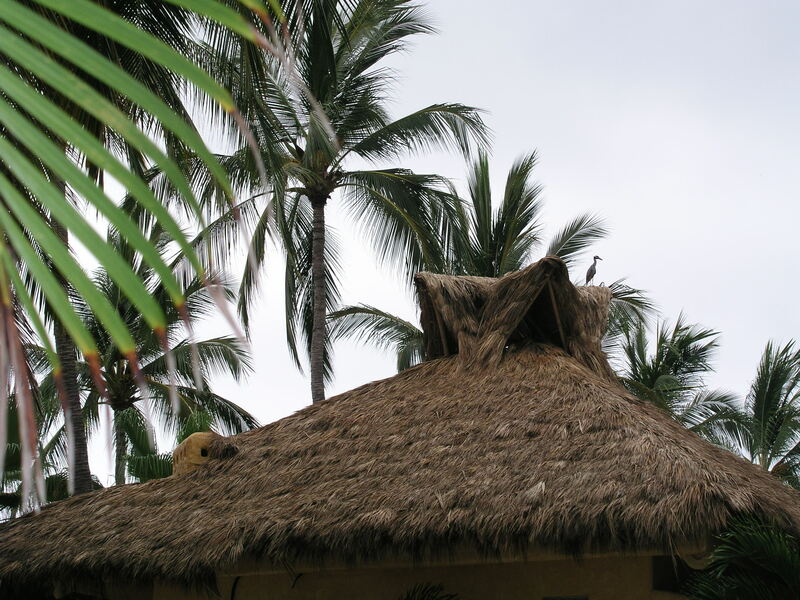 A heron on the neighbor’s roof. Click the photo twice to see his beautful, striped head. Chipotle Mozzarella Cheese Spread was just added to my list of different ways to use one of my favorite Mexican chiles, the fiery smoked jalapeño in adobo sauce. Company will be here soon to join us as the U.S. play Ghana in its bid for the World Cup. A two-ingredient dish is the key for getting a quick snack on the coffee table. Keeping up with my blog and the World Cup soccer games — and everything else in my life — is proving a challenge. More quick meals and snacks are coming out of the kitchen so that few games are missed. Am I crazy to watch so much TV? The World Cup is only once every four years, I keep telling myself. Yes, I probably am crazy. Blend cheese and chiles in a food processor until smooth. 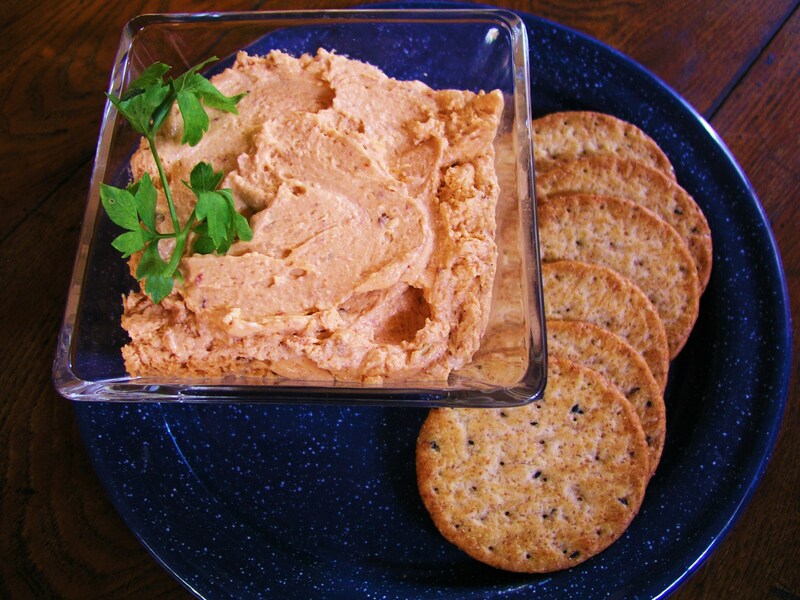 Garnish with cilantro leaves and serve with multi-grain crackers. Any soft cheese could be used instead of fresh mozzarella. Goat cheese, cream cheese or Mexican queso fresco or fresh panela would be just as good. This spread would make an attractive topping piped onto cucumber slices or in cherry tomatoes for a fancy canapé, though served with a good, whole-grain crackers is more my style. Update: Two days later, I saw Russ spreading Chipotle Mozzarella on crackers, and then topping them with a dab if guava jelly. I tried it — what a great taste combination with the hot and the sweet. The next day, I used the remainder in omelets with a filling of sautéed zucchini, onion and potato. Another winner. 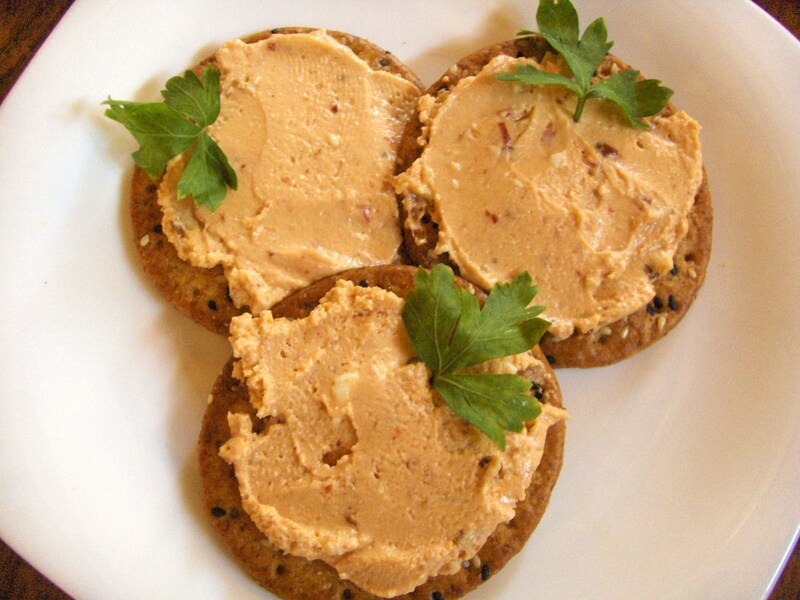 I’ll have to make Chipotle Cheese Spread again soon, if only to have left-overs to use in quesadillas and in lieu of compound butter on a hot slice of tenderloin of beef.